The New York Times Building recently was teeming with talk of the past, present and future of PR. The occasion was a panel during ARPR’s annual offsite retreat. As we entered through the building’s sophisticated security system, panelist Don Bates (far right in the photo, above), an adjunct instructor at NYU, reminisced about being a young PR pro, easily entering the Times’ offices, walking to a reporter’s desk and chatting about a story idea. Things have changed. As the panel started, the conversation shifted to how PR has evolved during the past five to 10 years. The emergence of MarTech solutions, the rapid convergence of communications and marketing and the rise in client expectations were cited. Listening to Bates; Gould + Partners managing partner Rick Gould; Sabrina Horn, senior advisor, technology practice at Finn Partners; and the moderator, PR News publisher Diane Schwartz (far left in photo), it became clear this is the most dynamic time in PR’s 120-year history. The panel projected that the advertising industry will diminish, propelling PR to lead. It was ironic to hear this prediction inside the home of America’s most iconic newspaper, which relies heavily on ad revenue. Horn discussed how blockchain is exposing ad agencies’ revenue models, citing Proctor & Gamble’s $400 million ad spending cut. “Blockchain is taking the float out of the system that otherwise ad agencies would get,” she said. In the face of this shift, “PR will be the standard bearer 20 years from now," Bates said. But to do so, "We need to fill all the holes, because our clients are using that as a measure of whether they want to hire us or not." The panel warned that PR's ability to lead is contingent upon communicators’ willingness to: 1) embrace technology and digitization, and 2) think strategically. The takeaway is that communicators must become versant in all aspects of marketing and today’s data-rich technologies. “In the M&A world, everything is about digital. Even if an agency has a decent digital division, they want a better one,” Gould said. To embrace the level of integrated marketing consultation needed, Horn challenged attendees to “understand business principles. Understand more than just PR.” Of course, financial acumen needs to begin in higher education settings. “Introducing more business thinking–on any dimension–into college and university PR programs would do so much for students entering the workforce,” she added. Once PR pros have a strong grasp of business objectives, they can begin to tackle what Schwartz said is the industry’s biggest quagmire: measurement. “PR is behind on measurement because it’s arguably harder to measure,” she said. The panel agreed that the key to proving ROI is helping clients monetize their campaigns. To bridge that gap, Horn suggested that agencies tie PR efforts to sales leads. “Help them justify their budgets and then they’ll give you more money,” she said. 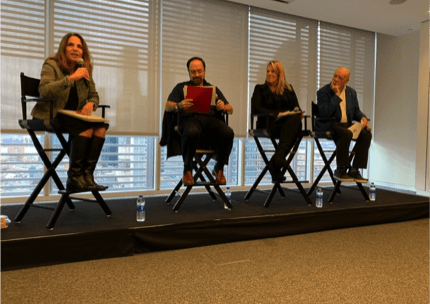 While modern forces are pushing PR to evolve, the panel argued that communicators can’t let go of relationships, the bedrock principle that built the profession more than 100 years ago. Editor's Note: To watch the full panel discussion click here.